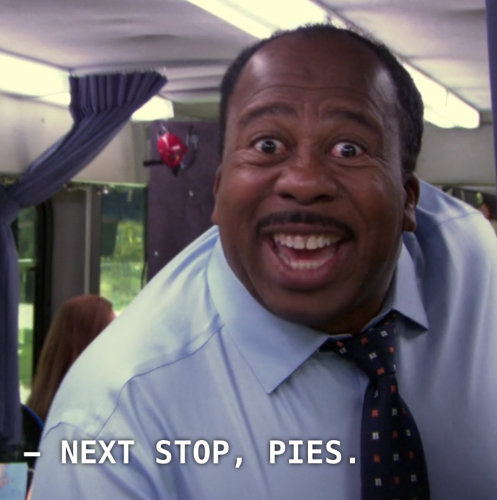 Dunder-Mifflin paper salesman Stanley Hudson expresses his excitement to feast upon pies. Unfortunately positioned between Halloween and Christmas, Thanksgiving often receives much less excitement than Halloween and Christmas. For many, on Nov. 1 the witch hats are cast aside and the Christmas lights are immediately strung up. While I, too, adore the holiday season, and I enjoy singing loudly along to Michael Buble’s Christmas album, I think that Thanksgiving as a holiday is not given enough credit. The third Thursday in November is devoted to food and family and usually naps – all excellent indicators of a swell time. And yet for much of the holiday season, Christmas gets almost all the hype, while poor Thanksgiving gets overlooked. Here are some reasons why everyone should stop appreciate Thanksgiving a little more. Thanksgiving food is superior in all respects. Stating the obvious, Thanksgiving food is truly wonderful. This brilliant holiday is centered largely around food and for many the food preparation can take multiple days. The food options are extensive and the number of side dishes is usually lengthy. How many side dishes are there actually supposed to be? Because my family usually averages around nine. There really is something for everyone. Mashed potatoes, green bean casserole, sweet potato casserole, cranberry sauce (which is excellent homemade, rather than from the can), turkey, stuffing, ham, rolls and countless pies – basically all of the glorious carbs. Also, let’s not forget about how good Thanksgiving leftovers are. Unlike Halloween and Christmas, Thanksgiving isn’t overly commercialized. Obviously, Christmas is all about the gifts, which is a festive and enjoyable tradition – but sometimes expensive and stressful. Halloween is also heavily commercialized. According to the National Retail Federation, Halloween spending for 2018 was predicted to reach $9 billion. Households were planning on spending more than last year. More than 175 million Americans planned on partaking in Halloween and the average of $86.13 household spending in 2017 was predicted to rise to $86.79 for 2018. Thanksgiving is a nice break between the two where no one is asking you to buy anything for them: there are just requests for additional pumpkin pie. Additionally, I am purposely not including Black Friday as a part of the Thanksgiving. For then Thanksgiving would indeed be commercialized. I have no problem with Black Friday, I think it is a festive beginning to the gifts and pizzazz of the holiday season. However, I think it is somewhat unfortunate that Black Friday is starting earlier and earlier every year. At this point, many stores are open on the evening of Thanksgiving day. Having Black Friday begin on Thanksgiving day infringes on Thanksgiving festivities and takes family time away from employees who have to work at the stores who participate in Black Friday. Excluding Black Friday as part of Thanksgiving, Thanksgiving is less about things and more about family and friends (and food). Time off from work and school to see your family and friends. Personally, I love any excuse not to have class and to see my family and friends. Thanksgiving is a time to reconnect with family. Also gathering more popularity, Friendsgiving is a wonderful time to appreciate your pals and gather together over food. Naps and casual attire are acceptable. Naps during Thanksgiving day seem more readily accepted than any other holiday. Do you need to sleep in preparation for excessive food? Okay! Do you need to nap after all of the pie? Go for it! Everyone loves a good food coma induced nap. Also, the dress code is open. Some dress up for Thanksgiving and that is great. Some people wear pants with an elastic waist so they can eat more – to each their own. Another thing about Thanksgiving is all the somewhat random traditions and recreational activities to partake in. Some families do the Turkey Trot and run 5K and then guiltlessly consume five pies – I’m all for it. For many others, Thanksgiving means watching football and the Macy’s Day parade together. Personally, I am a fan of the National Dog Show. If I have the opportunity to watch adorable pups instead of football, then you better believe I will take it. It’s a good time to reflect and appreciate. Not to sound like an 80 year-old man, but we could all do with being a little more thankful. In college it is exceedingly easy to focus on yourself, all the work you need to do, all the debt you’ve compiled and all the hours of sleep you haven’t gotten. Not to be cliche, but Thanksgiving really is a good time to reflect and say “Damn, I’ve got it okay.” If you are going to a private, liberal arts college, chances are you are doing better than a majority of America.